These tumble stones are from the Dominican Republic, the only known location for Larimar. They are a gorgeous soft blue colour with patches and areas of lighter and darker blue, just like you'd expect to see in Larimar ! The quality is very good indeed, the colour is excellent although there is a small amount of brown/grey matrix present. Lovely, lovely stones where good examples like these come along so infrequently. Larimar is a very cooling and soothing stone and is good for sunburn, inflammation and fevers. It helps to ease stress and is beneficial to the shoulders, the thyroid gland, the chest, neck and head area and also the nasal passages. It is said to stimulate brain activity. It is one of the very few stones that can help with the common cold. Also good for hair and for the feet. 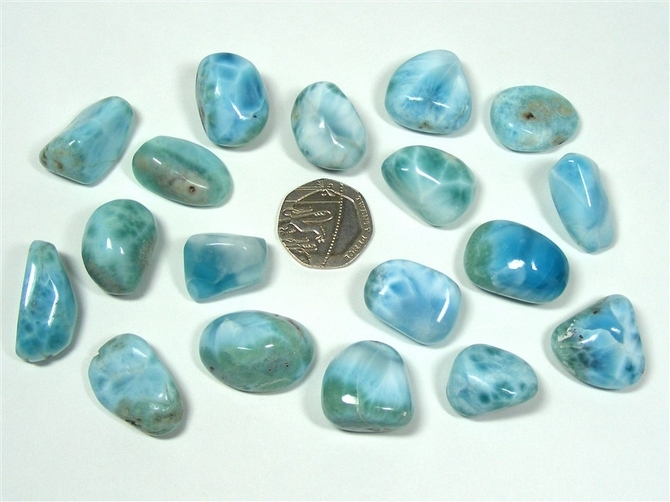 Larimar soothes fear and hurt and is extremely useful in treating depression and apathy. It helps people who are over-critical of themselves and of others to become more tolerant. It encourages truth (including helping you to admit guilt when you are guilty) self-expression, patience, creativity and artistic endeavours. 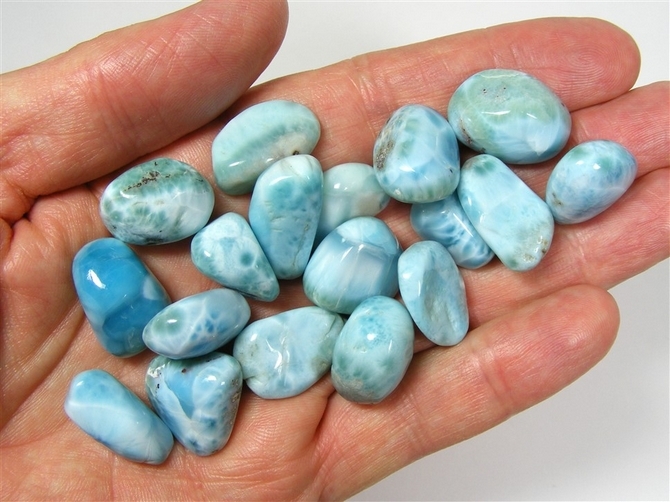 Larimar promotes an inner peace and calm and allows us to stay calm when changes are taking place all around us. Larimar also promotes simplicity, makes constructive thinking easier and allows us to simply "let things happen" instead of us trying to control and manipulate what is happening. It helps us to use power and knowledge wisely. A superb stone for Earth Healing. Larimar can also help us to "take control" of our own lives. Larimar shows us that suffering need not be present in our spiritual lives and that also our own spirit can be without bounds or limitations.